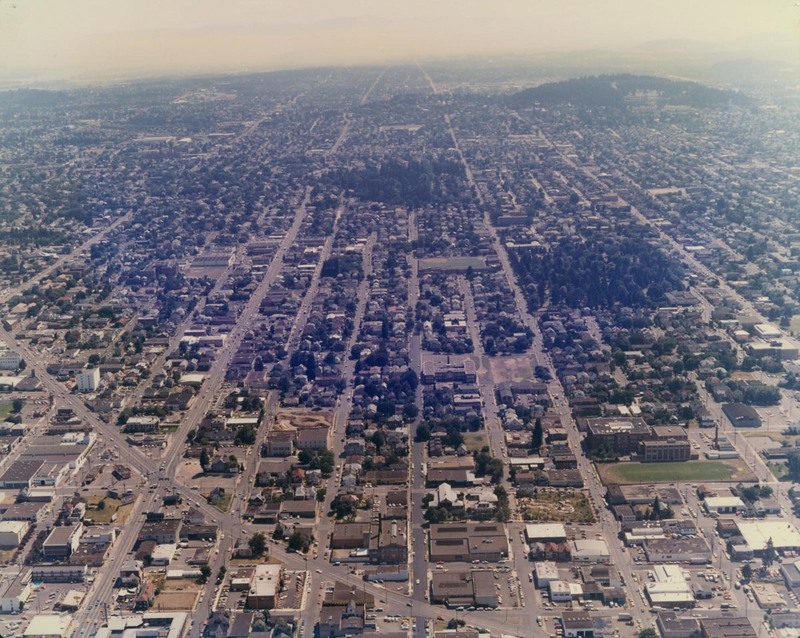 This 1975 aerial view shows the Southeast and Northeast Portland stretching east from the Buckman neighborhood past Lone Fir Cemetery, Laurelhurst Park, Mt. Tabor and into the distance. Sandy Blvd. cuts across the lower left part of the photo. Interesting. I would have thought that Laurelhurst Park is a lot bigger than Lone Fir Cemetery. It’s interesting to see how SE Stark lines up east and west of the shoulder of Mt. Tabor – which is not surprising because it is the Base Line Road. SE Stark veers around Mt. Tabor on SE Thorburn. SE Stark as a street doesn’t actually go through. See this view looking west. What are those two extra buildings around Washington High School??? Gym to the south and West Wing. Interesting to see what St. Francis park looked like back then. Lower part of the picture. Used to be a nice little park with a little stream flowing through it.